Another request! I was asked to write about continued fractions for the Leap Day 2016 A To Z. The request came from Keilah, of the Knot Theorist blog. But I’d already had a c-word request in (conjecture). So you see my elegant workaround to talk about continued fractions anyway. There are fashions in mathematics. There are fashions in all human endeavors. But mathematics almost begs people to forget that it is a human endeavor. Sometimes a field of mathematics will be popular a while and then fade. Some fade almost to oblivion. Continued fractions are one of them. A continued fraction comes from a simple enough starting point. Start with a whole number. Add a fraction to it. . Everyone knows what that is. But then look at the denominator. In this case, that’s the ‘3’. Why couldn’t that be a sum, instead? No reason. Imagine then the number . Is there a reason that we couldn’t, instead of the ‘4’ there, have a fraction instead? No reason beyond our own timidity. Let’s be courageous. Does even mean anything? Well, sure. It’s getting a little hard to read, but is a fine enough number. It’s 3.8. is a less friendly number, but it’s a number anyway. It’s a little over 0.526. (It takes a fair number of digits past the decimal before it ends, but trust me, it does.) And we can add 1 to that easily. So means a number a slight bit more than 1.526. Dare we replace the “5” in that expression with a sum? Better, with the sum of a whole number and a fraction? If we don’t fear being audacious, yes. Could we replace the denominator of that with another sum? Yes. Can we keep doing this forever, creating this never-ending stack of whole numbers plus fractions? … If we want an irrational number, anyway. If we want a rational number, this stack will eventually end. But suppose we feel like creating an infinitely long stack of continued fractions. Can we do it? Why not? Who dares, wins! Well … um. Continued fractions certainly had a fashionable time. John Wallis, the 17th century mathematician famous for introducing the ∞ symbol, and for an interminable quarrel with Thomas Hobbes over Hobbes’s attempts to reform mathematics, did much to establish continuous fractions as a field of study. (He’s credited with inventing the field. But all claims to inventing something big are misleading. Real things are complicated and go back farther than people realize, and inventions are more ambiguous than people think.) The astronomer Christiaan Huygens showed how to use continued fractions to design better gear ratios. This may strike you as the dullest application of mathematics ever. Let it. It’s also important stuff. People who need to scale one movement to another need this. In the 18th and 19th century continued fractions became interesting for higher mathematics. Continued fractions were the approach Leonhard Euler used to prove that e had to be irrational. That’s one of the superstar numbers of mathematics. Johan Heinrich Lambert used this to show that if θ is a rational number (other than zero) then the tangent of θ must be irrational. This is one path to showing that π must be irrational. Many of the astounding theorems of Srinivasa Ramanujan were about continued fractions, or ideas which built on continued fractions. But since the early 20th century the field’s evaporated. I don’t have a good answer why. The best speculation I’ve heard is that the field seems to fit poorly into any particular topic. Continued fractions get interesting when you have an infinitely long stack of nesting denominators. You don’t want to work with infinitely long strings of things before you’ve studied calculus. You have to be comfortable with these things. But that means students don’t encounter it until college, at least. And at that point fractions seem beneath the grade level. There’s a handful of proofs best done by them. But those proofs can be shown as odd, novel approaches to these particular problems. Studying the whole field is hardly needed. So, perhaps because it seems like an odd fit, the subject’s dried up and blown away. Even enthusiasts seem to be resigned to its oblivion. Professor Adam Van Tyul, then at Queens University in Kingston, Ontario, composed a nice set of introductory pages about continued fractions. But the page is defunct. Dr Ron Knott has a more thorough page, though, and one with calculators that work well. Will continued fractions make a comeback? Maybe. It might take the discovery of some interesting new results, or some better visualization tools, to reignite interest. Chaos theory, the study of deterministic yet unpredictable systems, first grew (we now recognize) in the 1890s. But it fell into obscurity. When we got some new theoretical papers and the ability to do computer simulations, it flowered again. For a time it looked ready to take over all mathematics, although we’ve got things under better control now. Could continued fractions do the same? I’m skeptical, but won’t rule it out. Postscript: something you notice quickly with continued fractions is they’re a pain to typeset. We’re all right with . But after that the LaTeX engine that WordPress uses to render mathematical symbols is doomed. A real LaTeX engine gets another couple nested denominators in before the situation is hopeless. If you’re writing this out on paper, the way people did in the 19th century, that’s all right. But there’s no typing it out that way. But notation is made for us, not us for notation. If we want to write a continued fraction in which the numerators are all 1, we have a brackets shorthand available. In this we would write as [2; 3, 4, … ]. The numbers are the whole numbers added to the next level of fractions. Another option, and one that lends itself to having numerators which aren’t 1, is to write out a string of fractions. In this we’d write . We have to trust people notice the + sign is in the denominator there. But if people know we’re doing continued fractions then they know to look for the peculiar notation. I’m going to assume everyone reading this accepts that logarithms are worth computing, and try to describe how Harvard’s IBM Automatic Sequence-Controlled Calculator would work them out. The first part of this is kind of an observation: the quickest way to give the logarithm of a number is to already know it. Looking it up in a table is way faster than evaluating it, and that’s as true for the computer as for you. Obviously we can’t work out logarithms for every number, what with there being so many of them, but we could work out the logarithms for a reasonable range and to a certain precision and trust that the logarithm of (say) 4.42286 is going to be tolerably close to the logarithm of 4.423 that we worked out ahead of time. Working out a range of, say, 1 to 10 for logarithms base ten is plenty, because that’s all the range we need: the logarithm base ten of 44.2286 is the logarithm base ten of 4.42286 plus one. The logarithm base ten of 0.442286 is the logarithm base ten of 4.42286 minus one. You can guess from that what the logarithm of 4,422.86 is, compared to that of 4.42286. This is trading computer memory for computational speed, which is often worth doing. But the old Automatic Sequence-Controlled Calculator can’t do that, at least not as easily as we’d like: it had the ability to store 72 numbers, albeit to 23 decimal digits. We can’t just use “worked it out ahead of time”, although we’re not going to abandon that idea either. In principle, we have to add up infinitely many terms to get the answer right. In practice, we only add up terms until the error — the difference between our sum and the correct answer — is smaller than some acceptable margin. This seems to beg the question, because how can we know how big that error is without knowing what the correct answer is? In fact we don’t know just what the error is, but we do know that the error can’t be any larger than the absolute value of the first term we neglect. Let me give an example. Suppose we want the natural logarithm of 1.5, which the alert have noticed is equal to 1 + 0.5. Then h is 0.5. If we add together the first five terms of the natural logarithm series, then we have which is approximately 0.40729. If we were to work out the next term in the series, that would be , which has an absolute value of about 0.0026. So the natural logarithm of 1.5 is 0.40729, plus or minus 0.0026. If we only need the natural logarithm to within 0.0026, that’s good: we’re done. In fact, the natural logarithm of 1.5 is approximately 0.40547, so our error is closer to 0.00183, but that’s all right. Few people complain that our error is smaller than what we estimated it to be. If we know what margin of error we’ll tolerate, by the way, then we know how many terms we have to calculate. Suppose we want the natural logarithm of 1.5 accurate to 0.001. Then we have to find the first number n so that ; if I'm not mistaken, that's eight. Just how many terms we have to calculate will depend on what h is; the bigger it is — the farther the number is from 1 — the more terms we'll need. The trouble with this is that it’s only good for working out the natural logarithms of numbers between 0 and 2. (And it’s better the closer the number is to 1.) If you want the natural logarithm of 44.2286, you have to divide out the highest power of e that’s less than it — well, you can fake that by dividing by e repeatedly — and what you get is that it’s e times e times e times 2.202 and we’re stuck there. Not hopelessly, mind you: we could find the logarithm of 1/2.202, which will be minus the logarithm of 2.202, at least, and we can work back to the original number from there. Still, this is a bit of a mess. We can do better. That is, if we could factor a number whose logarithm we want into components which we can either look up or we can calculate very quickly, then we know its logarithm is the sum of the logarithms of those components. And this, finally, is how we can work out logarithms quickly and without too much hard work. I confess that I picked up Edmund Callis Berkeley’s Giant Brains: Or Machines That Think , originally published 1949, from the library shelf as a source of cheap ironic giggles. After all, what is funnier than an attempt to explain to a popular audience that, wild as it may be to contemplate, electrically-driven machines could “remember” information and follow “programs” of instructions based on different conditions satisfied by that information? There’s a certain amount of that, though not as much as I imagined, and a good amount of descriptions of how the hardware of different partly or fully electrical computing machines of the 1940s worked. But a good part, and the most interesting part, of the book is about algorithms, the ways to solve complicated problems without demanding too much computing power. This is fun to read because it showcases the ingenuity and creativity required to do useful work. The need for ingenuity will never leave us — we will always want to compute things that are a little beyond our ability — but to see how it’s done for a simple problem is instructive, if for nothing else to learn the kinds of tricks you can do to get the most of your computing resources. The example that most struck me and which I want to share is from the chapter on the IBM Automatic Sequence-Controlled Calculator, built at Harvard at a cost of “somewhere near 3 or 4 hundred thousand dollars, if we leave out some of the cost of research and development, which would have been done whether or not this particular machine had ever been built”. It started working in April 1944, and wasn’t officially retired until 1959. It could store 72 numbers, each with 23 decimal digits. Like most computers (then and now) it could do addition and subtraction very quickly, in the then-blazing speed of about a third of a second; it could do multiplication tolerably quickly, in about six seconds; and division, rather slowly, in about fifteen seconds. The process I want to describe is the taking of logarithms, and why logarithms should be interesting to compute takes a little bit of justification, although it’s implicitly there just in how fast calculations get done. Logarithms let one replace the multiplication of numbers with their addition, for a considerable savings in time; better, they let you replace the division of numbers with subtraction. They further let you turn exponentiation and roots into multiplication and division, which is almost always faster to do. Many human senses seem to work on a logarithmic scale, as well: we can tell that one weight is twice as heavy as the other much more reliably than we can tell that one weight is four pounds heavier than the other, or that one light is twice as bright as the other rather than is ten lumens brighter. What the logarithm of a number is depends on some other, fixed, quantity, known as the base. In principle any positive number will do as base; in practice, these days people mostly only care about base e (which is a little over 2.718), the “natural” logarithm, because it has some nice analytic properties. Back in the day, which includes when this book was written, we also cared about base 10, the “common” logarithm, because we mostly work in base ten. I have heard of people who use base 2, but haven’t seen them myself and must regard them as an urban legend. The other bases are mostly used by people who are writing homework problems for the part of the class dealing with logarithms. To some extent it doesn’t matter what base you use. If you work out the logarithm in one base, you can convert that to the logarithm in another base by a multiplication. The logarithm of some number in your base is the exponent you have to raise the base to to get your desired number. For example, the logarithm of 100, in base 10, is going to be 2 because 102 is 100, and the logarithm of e1/3 (a touch greater than 1.3956), in base e, is going to be 1/3. To dig deeper in my reserve of in-jokes, the logarithm of 2038, in base 10, is approximately 3.3092, because 103.3092 is just about 2038. The logarithm of e, in base 10, is about 0.4343, and the logarithm of 10, in base e, is about 2.303. Your calculator will verify all that. All that talk about “approximately” should have given you some hint of the trouble with logarithms. They’re only really easy to compute if you’re looking for whole powers of whatever your base is, and that if your base is 10 or 2 or something else simple like that. If you’re clever and determined you can work out, say, that the logarithm of 2, base 10, has to be close to 0.3. It’s fun to do that, but it’ll involve such reasoning as “two to the tenth power is 1,024, which is very close to ten to the third power, which is 1,000, so therefore the logarithm of two to the tenth power must be about the same as the logarithm of ten to the third power”. That’s clever and fun, but it’s hardly systematic, and it doesn’t get you many digits of accuracy. So when I pick up this thread I hope to explain one way to produce as many decimal digits of a logarithm as you could want, without asking for too much from your poor Automatic Sequence-Controlled Calculator. It’s tricky to write about . That is, it’s not a difficult thing to write about, but it’s hard to find the audience for this number. It’s quite important, mathematically, but it hasn’t got an easy-to-understand definition like pi’s “the circumference of a circle divided by its diameter”. E’s most concise definition, I guess, is “the base of the natural logarithm”, which as an explanation to someone who hasn’t done much mathematics is only marginally more enlightening than slapping him with a slice of cold pizza. And it hasn’t got the sort of renown of something like the golden ratio which makes the number sound familiar and even welcoming. Still, the Mean Green Math blog (“Explaining the whys of mathematics”) has been running a series of essays explaining , by looking at different definitions of the number. The most recent of this has been the twelfth in the series, and they seem to be arranged in chronological order under the category of Algebra II topics, and under the tag of “E” essays, although I can’t promise how long it’ll be before you have to flip through so many “older” page links on the category and tag pages that it’s harder to find that way. If I see a master page collecting all the Definitions Of E essays into one guide I’ll post that. 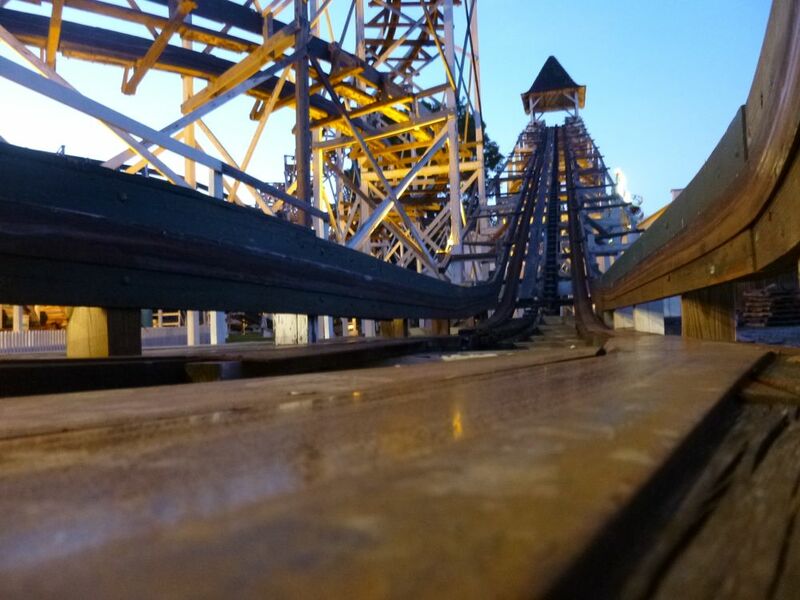 The above picture, showing the Leap-the-Dips roller coaster at Lakemont Park before its renovation, kind of answers why despite my neat reasoning and mental calculations I don’t really believe that there’s a chance of something like one in three that any particular board from the roller coaster’s original, 1902, construction is still in place. The picture — from the end of the track, if I’m not mistaken — dates to shortly before the renovation of the roller coaster began in the late 90s. Leap-the-Dips had stood without operating, and almost certainly without maintenance, from 1986 (coincidental to the park’s acquisition by the Boyer Candy company and its temporary renaming as Boyertown USA, in miniature imitation of Hershey Park) to 1998. The result of this period seems almost to demand replacing every board in the thing. But we don’t know that happened, and after all, surely some boards took it better than others, didn’t they? Not every board was equally exposed to the elements, or to vandalism, or to whatever does smash up wood. And there’s a lot of pieces of wood that go into a wooden roller coaster. Surely some were lucky by virtue of being in the right spot? So in my head I worked out an estimate of about one in three that any particular board would have remained from the Leap-The-Dips’ original, 1902, configuration, even though I didn’t really believe it. Here’s how I got that figure. First, you have to take a guess as to how likely it is that any board is going to be replaced in any particular stretch of time. Guessing that one percent of boards need replacing per year sounded plausible, what with how neatly a chance of one-in-a-hundred fits with our base ten numbering system, and how it’s been about a hundred years in operation. So any particular board would have about a 99 percent chance of making it through any particular year. If we suppose that the chance of a board making it through the year is independent — it doesn’t change with the board’s age, or the condition of neighboring boards, or anything but the fact that a year has passed — then the chance of any particular board lasting a hundred years is going to be . That takes a little thought to work out if you haven’t got a calculator on hand. where e here is the base of the natural logarithm, that is, that number just a little high of 2.71828 that mathematicians find so interesting even though it isn’t pi. The limit is, if you want to be exact, a subtly and carefully defined idea that took centuries of really bright work to explain. But the first really good feeling that I really got for it is to imagine a function evaluated at the points near but not exactly at the target point — in the limits here, where x equals zero — and to see, if you keep evaluating x very near zero, are the values of your expression very near something? If it does, that thing the expression gets near is probably the limit at that point. So, yes, you can plug in values of x like 0.1 and 0.01 and 0.0001 and so on into and and get a feeling for what the limit probably is. Saying what it definitely is takes a little more work. Anyway, what we’ve written down is something describing a relationship which we are willing to suppose is true. We might not know what x or y are, and we might not care, but at least for the length of the problem we will suppose that the number represented by y must be equal to three times whatever number is represented by x and minus two. There might be only a single value of x we find interesting; there might be several; there might be infinitely many such values. There’ll be a corresponding number of y’s, at least, so long as the equation is true. Sometimes we’ll turn the description in terms of an equation into a description in terms of a graph right away. Some of these descriptions are like as those of a line — the “y = 3*x – 2” equation — or a simple shape — “x2 + y2 = 4” is a circle — in that we can turn them into graphs right away without having to process them, at least not once we’re familiar and comfortable with the idea of graphing. Some of these descriptions are going to be in awkward forms. “x + 2 = – y2 / x + 2 y /x” is really just an awkward way to describe a circle (more or less), but that shape is hidden in the writing. I want to talk about drawing graphs, specifically, drawing curves on graphs. We know roughly what’s meant by that: it’s about wiggly shapes with a faint rectangular grid, usually in grey or maybe drawn in dotted lines, behind them. Sometimes the wiggly shapes will be in bright colors, to clarify a complicated figure or to justify printing the textbook in color. Those graphs. I clarify because there is a type of math called graph theory in which, yes, you might draw graphs, but there what’s meant by a graph is just any sort of group of points, called vertices, connected by lines or curves. It makes great sense as a name, but it’s not what what someone who talks about drawing a graph means, up until graph theory gets into consideration. Those graphs are fun, particularly because they’re insensitive to exactly where the vertices are, so you get to exercise some artistic talent instead of figuring out whatever you were trying to prove in the problem. There are a healthy number of legends about René Descartes. Some of them may be true. I know the one I like is the story that this superlative mathematician, philosopher, and theologian (fields not so sharply differentiated in his time as they are today; for that matter, fields still not perfectly sharply differentiated) was so insistent on sleeping late and sufficiently ingenious in forming arguments that while a student at the Jesuit Collè Royal Henry-Le-Grand he convinced his schoolmasters to let him sleep until 11 am. Supposedly he kept to this rather civilized rising hour until he last months of his life, when he needed to tutor Queen Christina of Sweden in the earliest hours of the winter morning. Place the name “Descartes” into the conversation and a few things pop immediately into mind. Those things are mostly “I think, therefore I am”, and some attempts to compose a joke about being “before the horse”. Running up sometime after that is something called “Cartesian coordinates”, which are about the most famous kind of coordinates and the easiest way to get into the problem of describing just where something is in two- or three-dimensional space. Can A Ball Of Yarn Threaten Three-Dimensional Space? All that talk about numbering spots on the New York Thruway had a goal, that of establishing how we could set up a coordinate system for the points on a line. It turns out just as easy to do this for a curve, even one a little bit complicated like a branch of the Thruway. About the only constraints we said anything about were that we shouldn’t have branches. Lurking unstated was the idea that we didn’t have loops. For the Thruway that’s nothing exceptional; if we had a traffic circle in the middle of a high-speed limited-access highway we wouldn’t very long have a high-speed highway. Worse, we’d have some point — where the loop crosses itself — that would have two numbers describing its position. We don’t want to face that. But we’ve got this satisfying little system where we can assign unique numbers to all the points on a single line, or even a curve. The natural follow-up idea is whether we can set up a system where we can describe a point on a surface or even in all of space using the same sort of coordinates scheme. And there’s the obvious answer of how to do it, using two numbers to describe where something is on a surface, since that’s a two-dimensional thing; or three numbers to describe where it is in space, since that’s a three-dimensional thing. So I’m not going to talk about that just now. I want to do something more fun, the kind of thing that could do nicely in late-night conversations in the dorm lounge if undergraduates still have late-night conversations in the dorm lounge. If we have a long enough thread, or a strand of yarn, or whatever the quite correct term is, we know this can be set up with a coordinate system by marking off distance along that thread. We imagined doing that, more or less, with the numbering system on the Thruway and imagining the straightening out and curving and other moving around of the highway’s center line. As long as we didn’t stretch or compress the strand any, we could spread it out in any shape we liked, and have coordinates for whatever path the strand traces out. Author Joseph NebusPosted on Tuesday, 8 November, 2011 Categories Explaining E, MathTags coordinate system, New York Thruway, number line, space-filling curves, yarn1 Comment on Can A Ball Of Yarn Threaten Three-Dimensional Space? So with several examples I’ve managed to prove what nobody really questioned, that it’s possible to imagine a complicated curve like the route of the New York Thruway and assign to all the points on it, or at least to the center line of the road, a unique number that no other point on the road has. And, more, it’s possible to assign these unique numbers in many different ways, from any lower bound we like to any upper bound we like. It’s a nice system, particularly if we’re short on numbers to tell us when we approach Loudonville. But I’m feeling ambitious right now and want to see how ridiculously huge, positive or negative, a number I can assign to some point on the road. Since we’d measured distances from a reference point by miles before and got a range of about 500, or by millimeters and got a range of about 800,000,000, obviously we could get to any number, however big or small, just by measuring distance using the appropriate unit: lay megaparsecs or angstroms down on the Thruway, or even use some awkward or contrived units. I want to shoot for infinitely big numbers. I’ll start by dividing the road in two. After all, there are two halves to the Thruway, a northern and a southern end, both arranged like upside-down u’s across the state. Instead of thinking of the center line of the whole Thruway, then, think of the center lines of the northern road and of the southern. They’re both about the same 496-mile length, but, it’d be remarkable if they were exactly the same length. Let’s suppose the northern belt is 497 miles, and the southern 495. Pretty naturally the northern belt we can give numbers from 0 to 497, based on how far they are from the south-eastern end of the road; similarly, the southern belt gets numbers from 0 to 495, from the same reference point. So we’ve introduced, with maybe more words than strictly necessary, the idea that we can set up a match between the numbers from 0 to 496 and particular locations on the New York Thruway. There are a number of practical quibbles that can be brought against this scheme. For example: could we say for certain that the “outer” edge of this road, which has roughly the shape of an upside-down u, isn’t loger than the “inner” edge? We may need more numbers for the one side than the other. And the mile markers, which seemed like an acceptable scheme for noting where one was, are almost certainly only approximately located. But these aren’t very important. We can imagine the existence of the “ideal” Thruway, some line which runs along the median of the whole extent of the highway, so there’s no difference in length running either direction, and we can imagine measuring it to arbitrarily great precision. The actual road approximates that idealized road. And this gives what I had really wanted, a kind of number line. All the numbers from zero to 496 (or so) match a point on this ideal Thruway line, and all the points on this Thruway match some number between zero and 496. That the line wriggles all over the place and changes direction over and over, well, do we really insist that a line has to be straight? Well, we can at least imagine taking this “ideal” Thruway, lifting it off the globe and straightening it out, if we really want to. Here we invoke a host of assumptions even past the idea that we can move this curvy idealized road around. We assume that we can straighten it out without changing its length, for example. This isn’t too unreasonable if we imagine this curve as being something like a tangled bit of string and that we straighten it out without putting any particular tension on it; but if we imagined the idealized road as being a rubber band, held taut at the New York City and Ripley, New York, ends and pinned in place at the major turns we notice that isn’t actually guaranteed. Let’s assume we can do this straightening-out without distorting the lengths, though. To return to my introduction of e using the most roundabout method possible I’d like to imagine the problem of telling someone just where it is you’ve been stranded in a broken car on the New York Thruway. Actually, I’d rather imagine the problem of being stranded in a broken car on the New Jersey Turnpike, as it’s much closer to my home, but the Turnpike has a complexity I don’t want distracting this chat, so I place the action one state north. Either road will do. There’s too much toll road to just tell someone to find you there, and the majority of their lengths are away from any distinctive scenery, like an airport or a rest area, which would pin a location down. A gradual turn with trees on both sides is hardly distinctive. What’s needed is some fixed reference point. Fortunately, the Thruway Authority has been generous and provided more than sixty of them. These are the toll plazas: if we report that we are somewhere between exits 23 and 24, we have narrowed down our location to a six-mile stretch, which over a 496-mile road is not doing badly. We can imagine having our contact search that. But the toll both standard has many inconveniences. The biggest is that exits are not uniformly spaced. At the New York City end of the Thruway, before tolls start, exits can be under a mile apart; upstate, where major centers of population become sparse, they can spread out to nearly twenty miles apart. As we wait for rescue those twenty miles seem to get longer.